Name Variation 14 October 1858 As of 14 October 1858, John Lebben was also known as Lubben. John Lebben was born in 1828 at Hannover, Germany. He was the son of (?) Lebben. John Lebben married Anna Weigel on 14 October 1858. John Lebben died on 12 January 1877 at Wisconsin. [S248] U.S. Federal Census 1860 U.S. Federal Census, by Ancestry.com, Page 40. Dwelling 299. [S247] U.S. Federal Census 1870 U.S. Federal Census, by Ancestry.com, Page 2. Dwelling 12. Name Variation Anna Weigel was also known as Annie. Married Name Her married name was Lebben. Anna Weigel was born in November 1841 at Hessen-Damstadt, Germany. She married John Lebben, son of (?) Lebben, on 14 October 1858. Anna Weigel died on 16 January 1904 at age 62. Anna Weigel immigrated in 1854. She had 8 with 5 living in 1900 children. [S246] U.S. Federal Census 1880 U.S. Federal Census, by Ancestry.com, NA Film Number T9-1427 Page Number 143D. [S245] U.S. Federal Census 1900 U.S. Federal Census, by Ancestry.com, ED35. Dwelling 88. John L. Lebben was born on 29 August 1861 at Wisconsin. He was the son of John Lebben and Anna Weigel. John L. Lebben married Anna B. Wackershauser, daughter of Henry Wackershauser and Louisa Maring, on 18 September 1888. John L. Lebben died on 19 February 1936 at age 74. Eve Lebben was born on 30 October 1863 at Wisconsin. She was the daughter of John Lebben and Anna Weigel. Anton William Lebben was born on 15 February 1866 at Wisconsin also reported as Feb 1867. Anton William Lebben married Ella (?) circa 1891. Anton William Lebben died in May 1936 at age 70. [S244] U.S. Federal Census 1910 U.S. Federal Census, by Ancestry.com, Year: 1910; Census Place: Smelser, Grant, Wisconsin; Roll: T624_1711; Page: 2B; Enumeration District: 0044; Image: 523; FHL Number: 1375724. [S250] U.S. Federal Census 1930 U.S. Federal Census, by Ancestry.com, ED22-12. Dwelling 90. Louisa Lebben was born on 18 June 1868 at Wisconsin. Catherine Lebben was born in December 1869 at Wisconsin. Otto Schulenburg was born on 18 November 1894 at Wisconsin. Otto Schulenburg married Louise M. Schroeder, daughter of William K. Schroeder and Bertha Krause, on 24 November 1949. Otto Schulenburg died in July 1977 at age 82. Otto Schulenburg obtained US Social Security Card at Wisconsin; last residence Cross Plains, Dane, Wisconsin. On 19 June 1930 Picture of Ferdinand Schulenberg family, Cross Plains, taken on the 50th golden wedding anniversary 19 Jun 1930. Published 12 Oct 1930 The Capital Times. He lived in 1944 at Cross Plains, Dane, Wisconsin. Married Name 30 July 1941 As of 30 July 1941,her married name was Schrank. Melvina Solchenberger was born on 7 September 1920 at Wisconsin. She was the daughter of Peter Solchenberger and Florence Malvina Engwall. 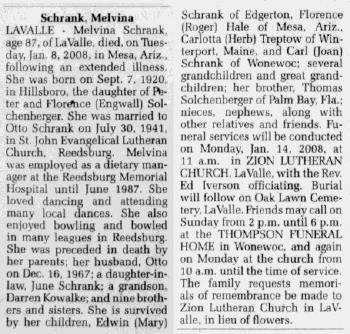 Melvina Solchenberger married Otto Emil Schrank, son of William H. Schrank and Louise M. Schroeder, on 30 July 1941 at Reedsburg, Sauk, Wisconsin, also reported as 07 Aug 1941. 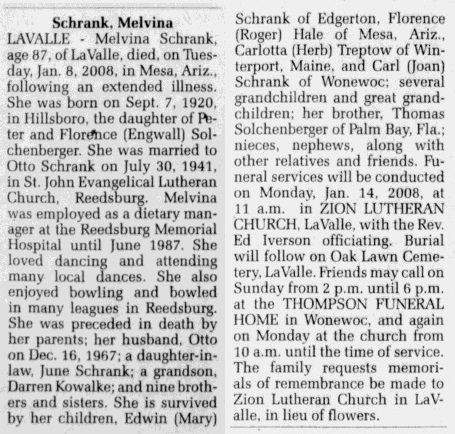 Melvina Solchenberger died on 8 January 2008 at Meza, Arizona, at age 87 Melvina (Solchenberger) Schrank obituary. She was buried on 14 January 2008 at Oak Lawn Cemetery, LaValle, Sauk, Wisconsin. 15 April 1930 Summit, Juneau, Wisconsin Melvina Solchenberger was listed as a daughter in Peter Solchenberger's household on the 1930 Census at Summit, Juneau, Wisconsin. Melvina Solchenberger had 4 children. She obtained US Social Security Card at Wisconsin; last residence La Valle, Sauk, Wisconsin. On 22 July 1960 at Shields Family Reunion, Madison, Dane, Wisconsin, The sixth Shields family reunion was held Sunday at the Fish Hatchery Park in Madison. Peter Solchenberger was born on 26 June 1883 at Wisconsin. Peter Solchenberger married Florence Malvina Engwall on 25 June 1913. Peter Solchenberger died on 12 February 1963 at Madison, Dane, Wisconsin, at age 79. He was buried after 12 February 1963 at Pine Eden Cemetery, Juneau, Wisconsin. 15 April 1930 Summit, Juneau, Wisconsin He was listed as the head of a family on the 1930 Census at Summit, Juneau, Wisconsin. Peter Solchenberger obtained US Social Security Card at Wisconsin; last residence Wisconsin. On 12 September 1918 at World War I Draft Registration, Sauk, Wisconsin. [S243] U.S. Federal Census 1920 U.S. Federal Census, by Ancestry.com, ED182. Dwelling 21. Married Name 25 June 1913 As of 25 June 1913,her married name was Solchenberger. Florence Malvina Engwall was born on 18 January 1895 at Illinois. She married Peter Solchenberger, son of Mathias Solchenberger and Margaret Ferguson, on 25 June 1913. Florence Malvina Engwall died on 9 April 1986 at age 91. She was buried after 9 April 1986 at Pine Eden Cemetery, Juneau, Wisconsin. 15 April 1930 Summit, Juneau, Wisconsin Florence Malvina Engwall was listed as wife in Peter Solchenberger's household on the 1930 Census at Summit, Juneau, Wisconsin. Married Name Her married name was Lowe. Evelyn Solchenberger married Elsworth Leroy Lowe. Evelyn Solchenberger was born on 6 December 1915 at Wisconsin. Evelyn Solchenberger died on 4 June 2000 at age 84. 15 April 1930 Summit, Juneau, Wisconsin Evelyn Solchenberger was listed as a daughter in Peter Solchenberger's household on the 1930 Census at Summit, Juneau, Wisconsin. Peter Matthew Solchenberger married Maude Lorraine Shields. Peter Matthew Solchenberger was born on 16 December 1918 at Wisconsin. He was the son of Peter Solchenberger and Florence Malvina Engwall. Peter Matthew Solchenberger died on 16 April 1955 at age 36. 15 April 1930 Summit, Juneau, Wisconsin Peter Matthew Solchenberger was listed as a son in Peter Solchenberger's household on the 1930 Census at Summit, Juneau, Wisconsin. Peter Matthew Solchenberger obtained US Social Security Card at Wisconsin; last residence not specified. Madeline Solchenberger was born circa 1923 at Wisconsin. Madeline Solchenberger died before 2008. 15 April 1930 Summit, Juneau, Wisconsin Madeline Solchenberger was listed as a daughter in Peter Solchenberger's household on the 1930 Census at Summit, Juneau, Wisconsin. John Solchenberger was born circa 1925 at Wisconsin. John Solchenberger died before 2008. 15 April 1930 Summit, Juneau, Wisconsin John Solchenberger was listed as a son in Peter Solchenberger's household on the 1930 Census at Summit, Juneau, Wisconsin. Married Name 3 October 1953 As of 3 October 1953,her married name was Shields. Lucille Solchenberger was born on 3 June 1926 at Wonewoc, Juneau, Wisconsin. Lucille Solchenberger married Harold J. Shields, son of William C. Shields and Alvina C. Damon, on 3 October 1953. Lucille Solchenberger died on 18 March 1999 at age 72. 15 April 1930 Summit, Juneau, Wisconsin Lucille Solchenberger was listed as a daughter in Peter Solchenberger's household on the 1930 Census at Summit, Juneau, Wisconsin. Lucille Solchenberger obtained US Social Security Card at Wisconsin; last residence Madison, Dane, Wisconsin. Matt Solchenberger was born on 21 June 1928 at Wisconsin. Matt Solchenberger died in October 1982 at age 54. 15 April 1930 Summit, Juneau, Wisconsin Matt Solchenberger was listed as a son in Peter Solchenberger's household on the 1930 Census at Summit, Juneau, Wisconsin. Matt Solchenberger obtained US Social Security Card at Wisconsin; last residence not specified. Thomas Solchenberger was born circa March 1930 at Wisconsin. Thomas Solchenberger died after 2008. 15 April 1930 Summit, Juneau, Wisconsin Thomas Solchenberger was listed as a son in Peter Solchenberger's household on the 1930 Census at Summit, Juneau, Wisconsin. Ethelind Parkhurst was born circa 1868 at Wisconsin. She was the daughter of John Parkhurst and Julia S. (?). [S246] U.S. Federal Census 1880 U.S. Federal Census, by Ancestry.com, NA Film Number T9-1431 Page Number 528C. Albert Parkhurst was born circa 1869 at Wisconsin. Katie C. Parkhurst was born circa 1872 at Wisconsin. George Parkhurst was born circa 1875 at Wisconsin. Evaline Parkhurst was born circa 1877 at Wisconsin. Herbert Parkhurst was born circa February 1880 at Wisconsin. Name Variation Frederick Albert Beuthein was also known as Beuthien. 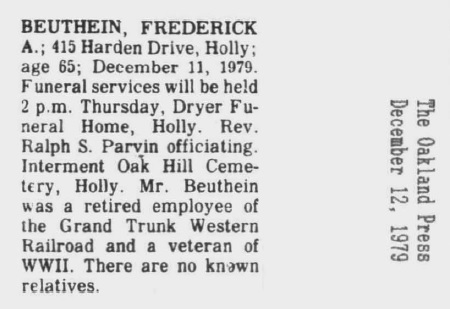 Name Variation Frederick Albert Beuthein was also known as Beuthen. Name Variation Frederick Albert Beuthein was also known as Fred. Frederick Albert Beuthein was born on 19 May 1914 at West Bloomfield, Oakland, Michigan. He was the son of Bernhard Beuthien and Lillian Koch. 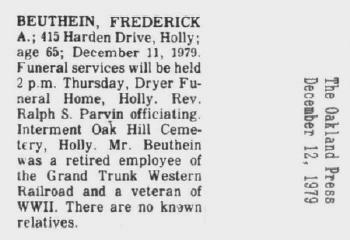 Frederick Albert Beuthein died on 11 December 1979 at Holly, Oakland, Michigan, at age 65 Frederick A Beuthein obituary. He was buried after 11 December 1979 at Oak Hill Cemetery, Holly, Oakland, Michigan. 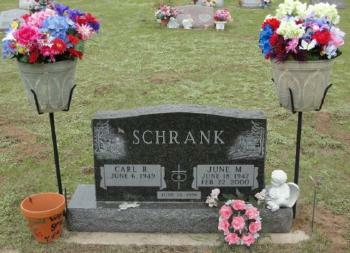 Carl Raymond Schrank was buried at Saint Johns Cemetery, Rock Springs, Sauk, Wisconsin. He was born on 6 June 1949 at twin with Carlotta. He was the son of Otto Emil Schrank and Melvina Solchenberger. Carl Raymond Schrank married June Marie Giebel, daughter of Donald Giebel, on 21 June 1986 at Sauk, Wisconsin. Carl Raymond Schrank died on 6 September 2013 at Madison, Dane, Wisconsin, at age 64 Carl R Schrank, age 64, of Wonewoc, died Friday, Sept 6, 2013 at UW Hospital in Madison, He was born on June 6, 1949 in Hillsboro, the son of Otto and Melvina (Solchenberger) Schrank. Carl was a 1967 graduate of Webb High School. He was a veteran of the Vietnam Era serving with the US Navy. On June 21, 1986 he was married to the former June (Giebel) Kowalke. She preceded him in death on Feb 22, 2000. He later married the former Joan Mittelstaedt on Jan 5, 2008. Carl started his working career at Almet in Baraboo whe he was then transferred to Indiana. Following June's death, he returned to the LaValle area. He then worked at Land's End and more recently at the Reedsburg Area Senior Life Center. 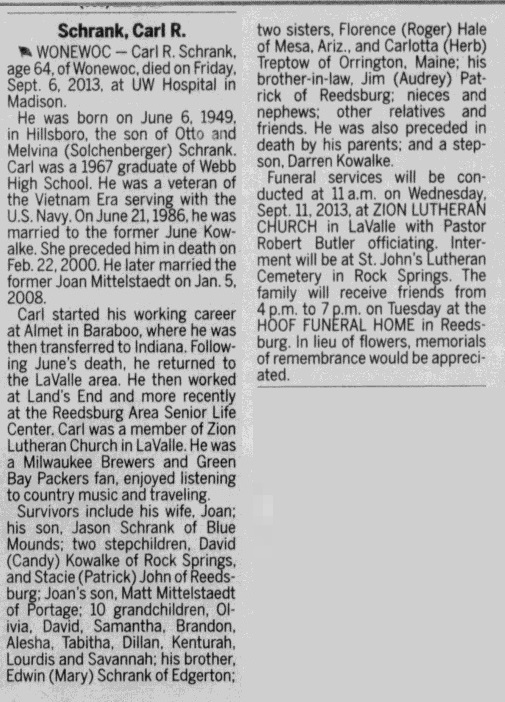 Carl was a member of Zion Lutheran Church in LaValle. 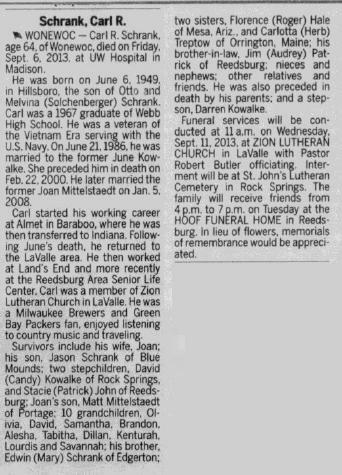 He was a Milwaukee Brewers and Green Bay Packers fan, enjoyed listening to country music and traveling. He was also preceded in death by his parents; and a stepson, Darren Kowalke. Survivors include his wife, Joan; son, Jason Schrank of Blue Mounds; stepchildren, David (Candy) Kowalke of Rock Springs and stacie (Patrick) John of Reedsburg; Joan's son, Matt Mittelstaedt of Portage; ten grandchildren, Olivia, David, Samantha, Brandon, Alesha, Dillan, Kenturah, Lourdis and Savannah; brother, Edwin (Mary) of Edgerton; two sisters, Florence (Roger) Hale of Mesa, AZ and Carlotta (Herb) Treptow of Orrington, ME; brother-in-law, Jim (Audrey) Patrick of Reedsburg; nieces, nephews and other relatives and friends. Interment will be at St John's Lutheran Cemetery in Rock Springs. On 22 July 1960 at Shields Family Reunion, Madison, Dane, Wisconsin, The sixth Shields family reunion was held Sunday at the Fish Hatchery Park in Madison. 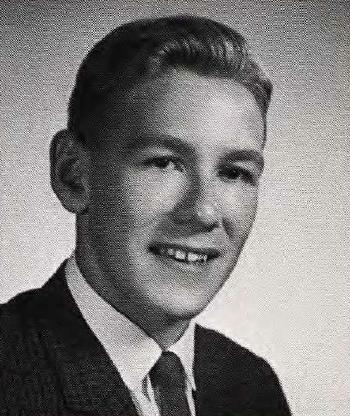 Carl Raymond Schrank graduated in 1967 at Webb High School, Reedsburg, Sauk, Wisconsin. Augusta Margaret Solchenberger was born on 8 February 1914 at Wisconsin. Augusta Margaret Solchenberger died on 14 January 1929 at Juneau, Wisconsin, at age 14. She was buried after 14 January 1929 at Pine Eden Cemetery, Juneau, Wisconsin. Name Variation Mathias Solchenberger was also known as Matt. Mathias Solchenberger was born on 24 February 1852 at Germany. Mathias Solchenberger married Margaret Ferguson on 7 June 1876. Mathias Solchenberger died on 5 December 1930 at Juneau, Wisconsin, at age 78 Matthias Solchenberger, 78, pioneer resident of central Wisconsin, passed away at 4 o'clock Friday morning at the home of his daughter, Mrs. Len Joslyn, in Armenia, following a lingering illness. Funeral services were held at 1 p.m. Monday from the Joslyn home, Rev. C. A. O'Neill of Nekoosa officiating. Burial was made in the Greenwood Cemetery in Armenia. Mr. Solchenberger was born February 24, 1852, in Germany, coming to this country with his parents at the age of 4. He was married June 7, 1876, to Margaret Ferguson at Wonewoc. His wife preceded him in death. He is survived by three daughters, Mrs. Joslyn, Mrs. Anna Kranske and Mrs. Frances Warner of Chicago, and four sons, George of Pensacola, Fla., Matt of Athens, Wis., Peter of Wonewoc and Robert of Nekoosa. Ship Name: D Havahgan (also reported as ship name D.H. Watjen). Edward William Solchenberger was born on 29 May 1885 at Wisconsin. Edward William Solchenberger married Rose Ann Ennis circa 1910. Edward William Solchenberger died on 28 August 1950 at Wisconsin at age 65. 22 April 1930 Woodland, Sauk, Wisconsin He was listed as the head of a family on the 1930 Census at Woodland, Sauk, Wisconsin. [S244] U.S. Federal Census 1910 U.S. Federal Census, by Ancestry.com, ED131. Dwelling 14. Name Variation Rose Ann Ennis was also known as Roseanne. Name Variation Rose Ann Ennis was also known as Rosa. Name Variation Rose Ann Ennis was also known as Rosie. Married Name circa 1910 As of circa 1910,her married name was Solchenberger. Rose Ann Ennis was born on 13 January 1893 at Wisconsin. She married Edward William Solchenberger, son of Anthony Solchenberger and Anna M. Baldinger, circa 1910. Rose Ann Ennis died on 26 September 1961 at age 68. 22 April 1930 Woodland, Sauk, Wisconsin Rose Ann Ennis was listed as wife in Edward William Solchenberger's household on the 1930 Census at Woodland, Sauk, Wisconsin.